Ants are among the most successful insects and are also among the most common pests in and around the home. They may build nests in the soil, in the open lawn, under concrete slabs, stones or boards, and adjacent to foundation walls, in the walls of the house, or in decaying wood or other cavities. 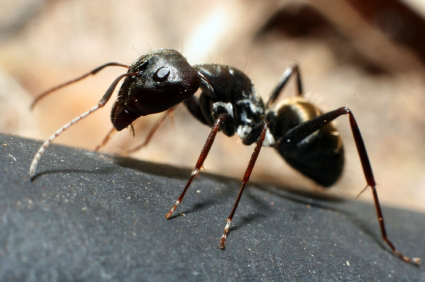 Black ants and the larger carpenter ants are commonly found in Indiana. Both types of ants are social insects and live in colonies with three distinct adult castes: queens, males and workers. The immature stages consist of eggs, larvae and pupae. Unlike other social insects, an ant colony may pick up its young and move if disturbed. Be sure to check out our affordable Power Spray Program to control ants all year long, without a contract. Most individuals in a colony are wingless workers. During the year, mature colonies produce winged males and females, which leave the colony in swarms. After mating, the female sheds her wings and attempts to establish a new colony. The male usually dies soon after mating. Queens may live up to 15 years, workers from 4 to 7 years. The winged swarmer ants are often confused with swarming termites. They are similar in appearance and both may be triggered to swarm by the same environmental conditions ¯ often a warm, sunny day following a rain. 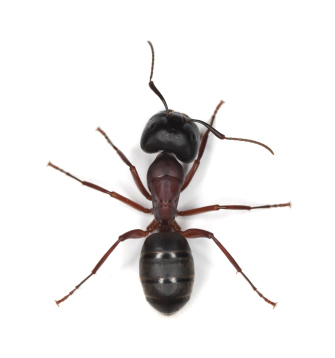 If you want to know more about ants and how to control them feel free to call us at (765) 342-2546.